Albina Baltina-SKIGIN, born November 1st, 1967 in Saint Petersburg, Russia, resident at 24-29 Boulevard Princesse Grace, Monte Carlo. Dimitrios SKIGIN divorced Albina, his second wife, in 2001. They have a daughter, Polina. He replaced Albina with 18 year-old Evgenya KIRILOVA, who married SKIGIN in Cap Ferrat in May 2005 on his deathbed. SKIGIN's first wife, Liubov ILINSKAIA, is suing Albina in a French court in Nice to retain assets already seized. A hearing is scheduled for the 15th of November at 9 a.m. in Tribunal de Grande Instance of NICE. This on-going case threatens to expose all the machinations of the SKIGIN/SOTRAMA money-laundering enterprise in Monaco, along with all assets acquired with laundered funds. The defendants in this action include Dimitrios SKIGIN's sons, Mikhail and Evgeny SKIGIN. 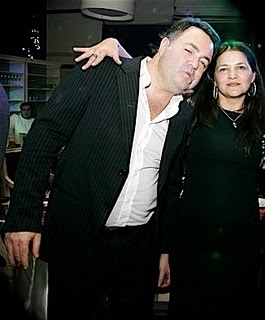 PHOTO: Vladimir SKIGIN, brother of Dimitrios and beneficiary of money laundered by SOTRAMA S.A.M. in Monaco, and Albina Baltina-SKIGIN.